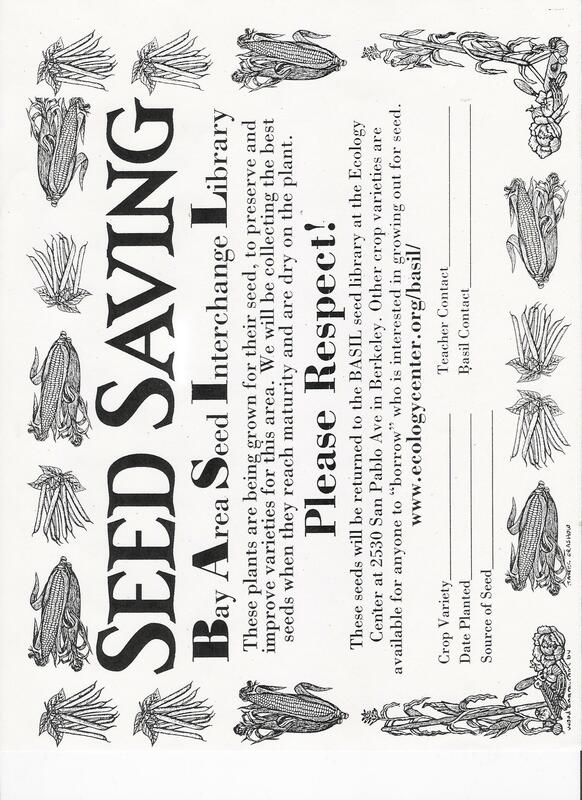 The Bay Area Seed Interchange Library (BASIL) Project is part of a growing network of concerned farmers and community gardeners dedicated to conserving the remaining genetic diversity of our planet’s seed stock. We have created a library of healthy vegetable, herb, and flower seeds that are available free to the public at the Ecology Center in Berkeley. BASIL hopes to encourage good growing techniques by offering seed saving classes, access to literature, and one-to-one help from experienced seed savers. We are a dynamic group that needs your support and involvement! Email basil@ecologycenter.org or call us at (510) 548-2220 ext.233 to learn more. BASIL is an attempt to bring together a wide variety of gardeners to lay the foundation for a local seed growers’ network that can take responsibility for developing crops and adapting them to our bioregion. Seeds are magical: given proper stewardship, they will acclimate to specific areas over time. By growing them out, we weave the stories of our lives and seeds into an unending chain of community, tradition, and history. If we can create a local abundance of fertile and non-engineered seed, we can participate in the International Solidarity Seed Project by donating our surplus to communities around the world that have difficulty accessing viable, open-pollinated seed. How does the seed library work? 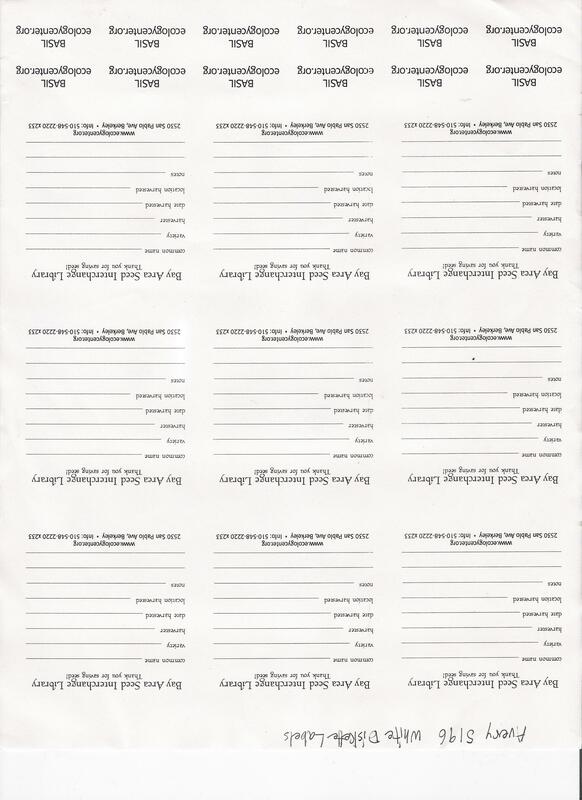 Local gardeners and farmers can “check out” seeds with the agreement that they attempt to grow them out and “return” some seeds of the next generation at the end of the season. View the following video to learn how the library works. In the last three decades, the majority of the world’s family-owned seed companies have been bought out by multinationals such as the Monsanto and Novartis corporations. These companies are not interested in creating sustainable food systems and communities. They are busy replacing carefully bred strains of vegetables and flowers with their own hybrids and patented varieties. Hybrids don’t produce viable seed, and the seed from patented varieties cannot legally be collected and used. Instead, the seeds must be bought fresh each year, forcing gardeners and farmers to purchase from corporate seed sources annually. Genetic engineering enables “life science” corporations to control plant traits by “programming” the seeds. Monsanto’s infamous implementation of trait-control technology is often referred to as the “Terminator” seed. “Terminator” seeds yield plants that produce no viable seed of ther own. Trait-controlled plants that breed with traditional varieties may pass on engineered traits to the offspring. If non-evolved plant varieties are permitted to squeeze out natural and/or carefully cultivated varieties, seed saving may nearly disappear. Our nourishment or hunger might then depend on chemically dependent or infertile trait-controlled plants. Traditional knowledge of seed saving and plant propagation techniques exists in fewer and fewer minds and communities. In order to create a positive ecological future for the planet, we need to begin teaching each other the skills necessary to save our own seeds. We’ve got to engage with traditional agricultural knowledge, and work to anticipate the needs of future generations. The Ecology Center (2530 San Pablo Avenue) houses our seed library. Tell your friends and fellow community gardeners about our project!